We are a leading offshore website & software development company in Pune. We offer solutions like web application development, responsive website designing & development, development of CMS based websites, WordPress based websites, eye catching landing pages, B2B / B2C portals and e-commerce, online stores and mobile applications. We provide world class shared web hosting and dedicated servers, VPS, CMS hosting and cloud based web hosting having our own servers in US, UK, Singapore, Germany, Japan and India. We also offer digital marketing services like on-page Search Engine Optimization (SEO) and off-page SEO with guaranteed top ranking, back linking, Social Media Marketing (SMM), explainer videos and complete digital brand building solutions. Use our trending and user friendly software solutions to grow your business exponentially. With our expert software engineers having relevant experience in their domain. Our android app developers are proud to offering experienced development for Android app. Offshore development in India is driven by economic values and high quality. Talk to us Today! Check out the Static Websites, Portals & E-commerce Websites portfolio section where we showcase the work we have done for our clients. India's best SSD web hosting, eCommerce web hosting, WordPress web hosting, unlimited space and email hosting and domain name registration company 'Ashtech' now offers a Solid-state drive with most web hosting plans in Pune. Ashtech brings you the most innovative and economical web hosting solutions which fit your budget. We are specialized in providing quality web hosting in Pune on Windows as well as Linux platforms. We offer reliable shared web hosting, dedicated servers, VPS hosting, cloud hosting, web hosting optimized for ecommerce and CMS websites on our dozens of servers in US, UK, Singapore, Germany, Japan and India. Under our hosting division we also provide domain name registration, G suite solutions to unleash Google for Work services, corporate mailing solutions with 99.9% up-time guarantee and reseller web hosting in Pune. Under our Digital Media Marketing division we provide Facebook push notification marketing, Facebook messenger private message marketing, web push notification service, explainer whiteboard video presentation services, on-page SEO and off-page Search Engine Optimization (SEO) in Pune for guaranteed top 10 ranking on Google, Bing, Yahoo etc., Social Media Marketing (SMM), Bulk Email and Bulk SMS Services with API at economical rates. 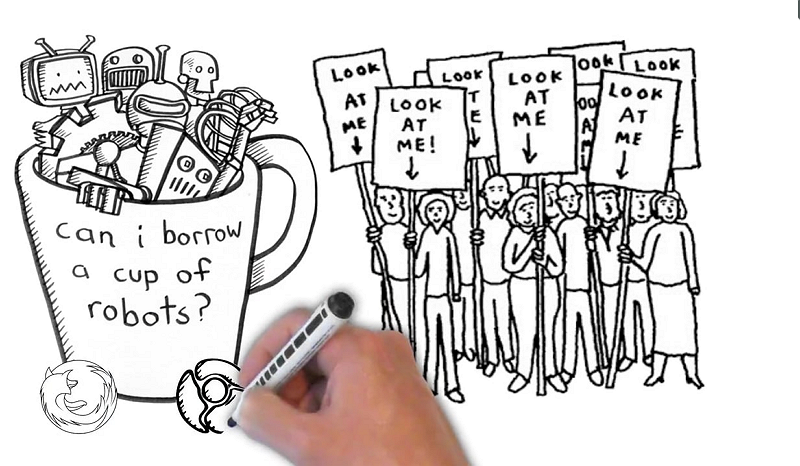 It accounts for 57% of the consumer Internet traffic and that will reach to 79% within 2 years. But creating web compatible light weight videos is not everybody's piece of cake. It requires lot of thinking, planning, storyboarding, creative sketching like this, music, voice overs and equally great editing. But don't worry. 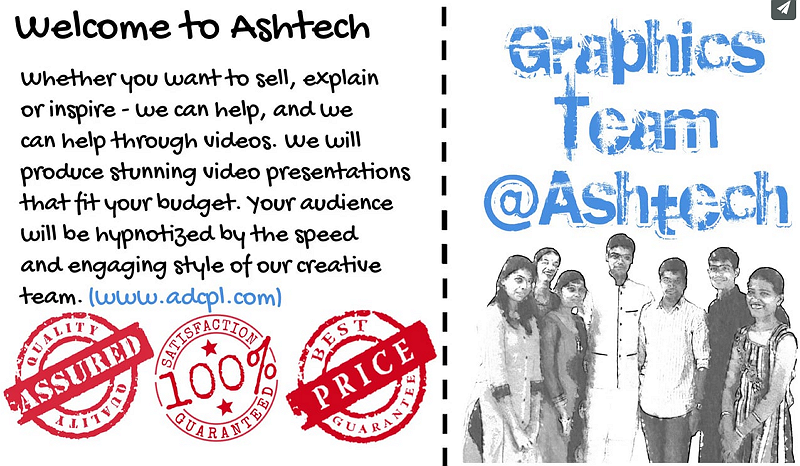 At Ashtech we have a complete team of creative minds who can make great videos for you. My new websites which are designed and developed by ADC are 1000 times better than what I had earlier from other designers in the city. I have experienced many web development companies and now planning to stick with ADC. I can now confidently tell you that even though there are thousands of web solution providers in the country, Ashtech stands out from this crowd by their extraordinary service and quality of the final product. In short, I can recommend Ashtech without any reservation to any organization in need of the web services. We have assigned number of innovative projects to Ashtech, which needed besides good technical expertise, lot of management skills. They took special efforts to understand the requirements of Agri Sector. Ashtech Digital Concepts (ADC) constructed our website. It was a job requiring expertise, imagination, and personal commitment. We were seriously pressured for time. Consequently, we demanded results from Ashtech that one would not ordinarily request. Ashtech came through willingly and on time. ADC throughout was responsive, efficient, supportive and creative. They went beyond the call of duty to be sure our project was completed in a timely and professional manner. The support and devotion, the commitment and dedication that we received from ADC far outstripped anything we had seen before and anything that one would reasonably expect.